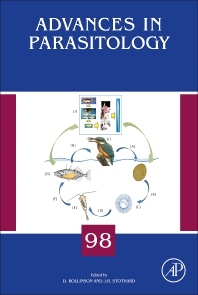 Advances in Parasitology, Volume 98, first published in 1963, contains comprehensive and up-to-date reviews on all areas of interest in contemporary parasitology. The latest release in this series contains chapters on The battle against flystrike – past research and new prospects through genomics, Life history, systematics and evolution of the Diplostomoidea Poirier, 1886: progress, promises and challenges emerging from molecular studies, Hook, line and infection: a guide to culturing parasites, establishing infections and assessing immune responses in the three-spined stickleback, and Trypanosoma congolense: a molecular toolkit and resources for studying a major livestock pathogen and model trypanosome. The series includes medical studies of parasites of major influence, such as Plasmodium falciparum and trypanosomes. The series also contains reviews of more traditional areas, such as zoology, taxonomy, and life history, which help to shape current thinking and applications.